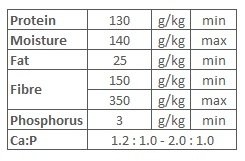 A high fibre feed suitable for areas with low roughage availability. This molasses-free complete feed that contains both the roughage and concentrate portions required in a feed program, when roughage is of poor quality or unavailable. This meal is fortified with vitamins and minerals and includes chaffed teff. Horses prone to laminitis, colic, choking and post-op horses in recovery. The meal is molasses free! Sunflower Oil Cake, Vegetable Oil, Molasses, Lucerne, Bran, Full Fat Soya, Soya Oil Cake, Lupins, Salt, Limestone, MCP, Lysine, Methionine, Vitamins & Minerals. Sunflower Oil Cake, Vegetable Oil, Lucerne Chaff, Oaten Hay Chaff, Bran, Full Fat Soya, Soya Oil Cake,Lupins, Salt, Limestone, MCP, Lysine, Methionine, Vitamins & Minerals.